Ive always been a huge fan of IKEA ever since i can remember, in fact i remember being introduced to them via one of my then neighbours wayy back in the 80’s. (Gosh that’s Eons ago!) Its an infatuation that im glad to report hasn’t diminished. So you can imagine my absolute delight when i was asked if i would like to use some of their product in my own home. IKEA have just recently relaunched some of their design classics from times gone by which they are branding as “Re-imagined Classics” and are re-releasing in 2018. The 1st collection of these brilliant pieces with designs from the 50’s & 60’s are in store and online now, with other decades, 70’s & 80’s, and the 90’s & 00’s being released at a later date in the year. So i guess youre itching to know which pieces i chose right? Well we’ve just recently redecorated our Hallway and id always fancied a little reading area/corner in the space, so for me my 1st choice, it had to be the STRANDMON armchair, which i happen to think is THE perfect reading chair with its high back and winged sides. (You can see it on the right in the pic above) perfect for hunkering down with a good book. I love to piping on the seat cushion and detail on the scroll arms. Button detail on the back gives a mid-century vibe. All looking super cool right? Super cute brass tipped legs, for a touch of luxe. The tabletop has a faux wood detail which i think adds extra texture and adds bags of style. And so there you have it, i think you’ll agree, these new pieces have really added that extra shot of vintage charm to our space, and i couldn’t be happier with them. Thank you so much IKEA!! Good Morning, and welcome to our very 1st round of Revamp Restyle and Reveal! .Thank you Bianca for the introduction, that is one seriously gorgeous kitchen you have there now! The funny thing is, when I announced I was going to be making over the lounge, I received an absolute tonne of really great comments from folk saying how nice the room already was and that it didn't need changing etc, which was really lovely, however for me after living with it for a while, (nearly a year, that must be a personal record for this serial decorator...lol) I always felt it was just missing something. So top of my list for what I had planned for the room was going to be a big injection of colour, the walls were painted in a soft neutral with a pink undertone, which as I said was all very lovely but just not working for me anymore. One of our lovely sponsors was Earthborn Paints and after looking at their fab paint range I knew exactly what I wanted. and Gingham for the ceiling. I loved the way the 2 colours played off against each other 'Milk jug' has a slight Aqua tone, where 'Gingham' has a much more gray tone to it, This was really obvious when the 2 colours sat side by side, where the walls meet the ceiling. Speaking of the ceiling one thing that was glaringly obvious was although living in a period property someone at some point had decided to get rid of the ceiling rose (sacrilege!) It was something that had bugged the life out of me ever since I moved in years ago, so RRR gave me the perfect opportunity to actually address this issue. So I knew I wanted something different for a ceiling rose and I couldnt really find anythingthat knocked my socks off. Then I had a bit of a Eureka moment, as I remembered I had an old sunburst mirror that used to be above the bed in our bedroom, it was a great size and super lightweight so would be perfect, I just added a small 12" resin ceiling rose which fitted like a glove. Here you can see both of the paint colours side by side and my ahem "bespoke" ...ceiling rose all painted out in the same colour as the ceiling, working its magic. Next on the hit list of things to do was to address the spaces either side of the fireplace, these alcoves are actually not very deep...and id always wanted to have shelving either side the chimney breast to add extra detail to that wall. So off I trotted down to my cellar and gathered all kinds of different scraps of wood to create some shelving and the italianate plinths for the tops for a touch of Grandeur. As I said I only really had scraps and off cuts of wood from past projects, some pieces were timber but some were Melamine, and as anyone who's tried to paint Melamine will know, regular paint just wont stick to it. .Thankfully Frenchic paint came to the rescue, Frenchic Furniture paint is a fabulous chalk paint which will stick to anything, so a quick coat of that, provided me with the perfect 'key' for me to then paint over with eggshell in the same colour as the walls. Next I needed some new chairs for my Gentlemans club meets Miami lounge, and the lovely folks at Maisons du Monde certainly heard my prayers! They provided me with THE most gorgeous sumptuous velvet club chairs,. 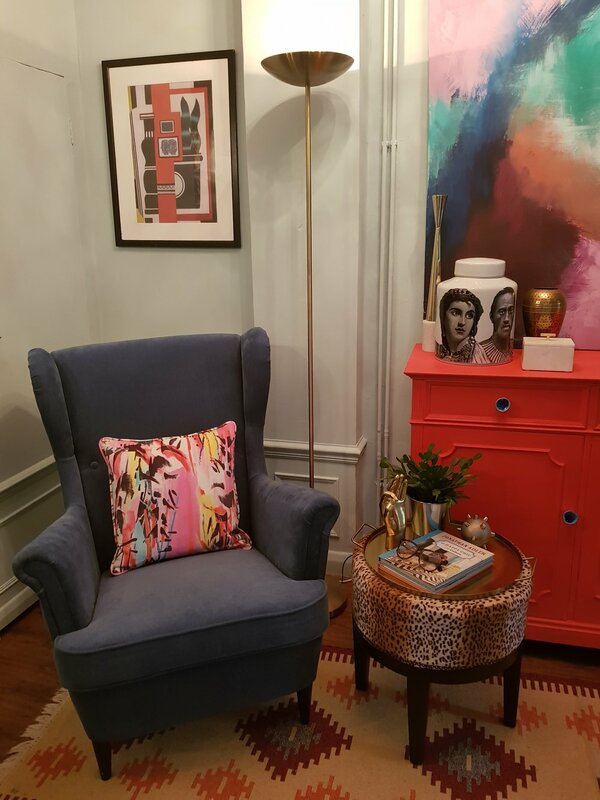 The Baudelaire armchairs come in a variety of colours and I picked the Peacock Blue, which in the flesh are actually the most gorge shade of Teal, so they compliment the wall colour so perfectly. Incidentally the Artwork you see behind the chairs was a little something I rustled up,in another of my Blue Peter moments, it was made from some strip timber from the timber merchants and held together with right angle brackets, I then stapled taut an old duvet cover to it. 5 coats of plain old white Emulsion, to create a canvas, I then used loads of tester pots of paints that I had stored away and just made it up kinda freestyle as I was going along...definitely a great fun project to try at home guys! I had to bring this thru to the halfway as it had started to rain outside. Right so we now have this fab lounge but seeing as its 2 guys who live here, we would of course have to have a little bit of tech, yes boys and their toys eh? This is where the awesome guys at ao really came into their own and provided us with an incredible tv and a home cinema surround sound system, if seeing is believing, then this really has to heard to be believed! Now the nights are drawing in, its going to be fab to binge watch Netflix this bad boy! 4K Television, picture quality is insane, and the sound blows ya socks off! Ok so those were some of my highlights that are now in my new look lounge, heres a few more pics from different angles. Sometimes you just gotta have Leopard print curtains. So there you have it, that's what has been keeping me busy these past few weeks, I really hope you like our new look lounge. Make sure to follow along to the next blogger on the list, I hand you over to the always lovely Ms Kerry Lockwood. The real deal with Teal. Hope your all doing super well, thanks so much for dropping by to read my second blog post. Today id like to talk about one of my absolute favourite topics....colour!, I'm pretty sure you're all aware of my enduring love affair with the myriad of colours, patterns and textures one gets to play with while working in interiors, and its one of those many colours that I want to talk about today, the colour as the title of this post kinda gives away, is one of my all time faves, Teal. The colour Teal, believe it or not, actually gets it name from a small freshwater Duck, which has greenish blue plumage on the side of its head and wings, now you can't ever say I don't give you useless facts! So for any of you guys that have been living in a cave all your life, a la Hermit stylee, Teal is a mid-tone to dark, greenish- blue, i say mid tone, as any lighter and we start bordering onto Turquoise territory, which is a whole different ball game entirely. Teal is extremely versatile in interiors, and is thought to represent balance, calm and soothing. So without further ado, and me waffling on way too much, lets look at some examples of Teal in action. As you can see from this gorgeous image above from Urban Outfitters, the walls, woodwork and the sofa have all been painted out in different tones of Teal, which provides the perfect backdrop for the the brighter blue accents to really pop. Also note the use of different textures, the shiny glass against the velvet of the sofa. The shaggy Mongolian throw although a similar tone to the couch, is a completely different texture so still creates interest. Heres another beautiful example, we get to see just how glamourous Teal can be, in this beautiful dressing room the Teal wardrobes wrap around the whole space creating a sumptuous rich backdrop of colour, which teams beautifully with the soft blues and greys in the rug and the grey planked ceiling. I particularly love the vintage, brass and crystal 'palm' chandelier, which helps to add that touch of Hollywood Regency glam. In her North London home, colour aficionado and blogger Bianca Hall, has painted out her family/TV room in a gorgeous shade of Teal, taking the colour all the way up onto the ceiling too, which is always a great way of getting the full impact of any colour as the wall colour isn't suddenly "cut off" by say a white ceiling. Notice just how great the deep indigo textural rug looks teamed with the wall colour? Talk about fabulous! 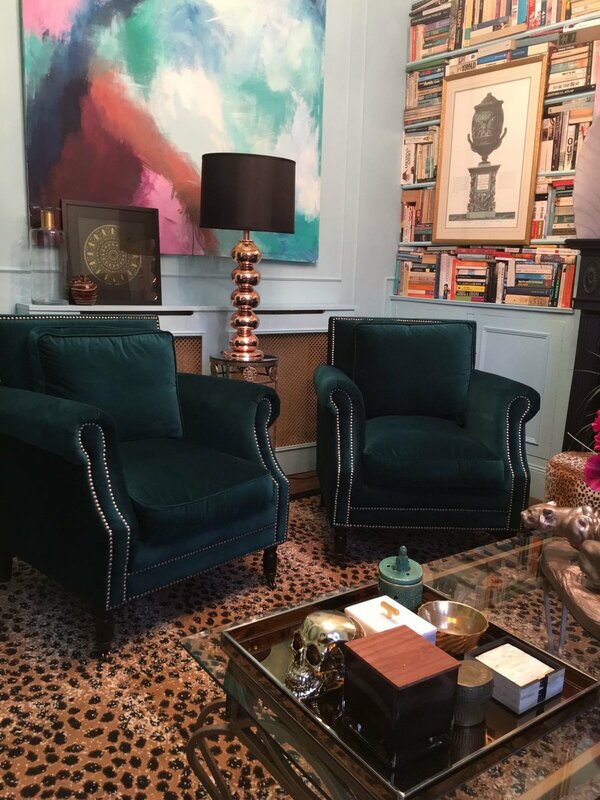 So say you love the idea of Teal but are maybe a little nervous of painting out a whole room in it?, you could always incorporate some Teal elements into your space, like in the picture below of the home of Spanish Interior stylist Jaime Lacasa . Jamie has been dubbed one of the most stylish men in Madrid, and looking at his awesome home you can begin see why. His Madrid apartment has a laid back eclectic vibe, with loads of what I like to call colour "moments" one of these being the fab Robins egg floor and of course the floor to ceiling Teal bookcases. 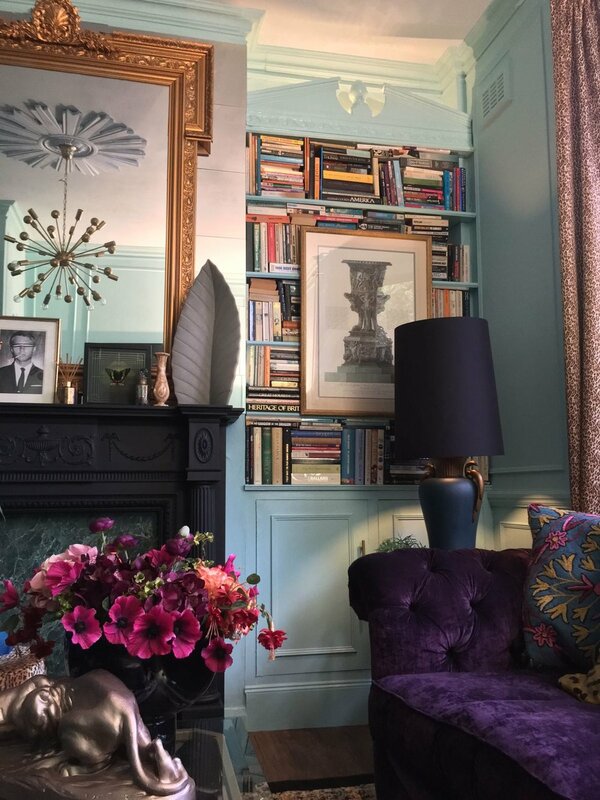 Here in this gorgeous Library by the master Interior Designer Ken Fulk, I think you'll agree the Teal helps to add that touch of cool contemporary colour and edge, to a what without it, would be a very traditional space indeed. So you can see, from all the different spaces and vibes created above Teal really is a super versatile colour, and who knows, maybe next time any of you guys are thinking of redecorating a space in your own home, maybe you'll stop to consider good old Teal a bash? Well I guess that's enough of me nattering on, trust me I could go on forever, please feel free to like and maybe leave a comment, id love to know what you guys think about Teal, have you used it in your own home, or maybe some of the other colour choices you.ve made..Drop me a line id love to know. Hello there folks, and welcome to my very first blog post! Finally at last, after what seems like an eternity, I've summoned up the bottle to start writing my blog! I'm not really sure why its taken me so long to get started, I guess, truth be told I was just being a big ol scaredy cat, and you know what? you don't get too far in life by giving into fear like that so I figure now's the time to face that fear and just go for it! So all that having been said, what am I going to talk about? Well one of the first questions I always seem to get asked whenever i get the opportunity to say I'm an Interior designer is "Whats your style?" which on the one hand is great, that people are showing an interest, but its a really difficult question to answer in one simple clear sentence (and perhaps a subject for another blog post) I usually say my style is eclectic, colourful and layered, and its the layered aspect id like to chat about today, in particular how to add another "layer" to walls, other than paint or wallpaper. One of the easiest ways, this can be achieved is to think about adding decorative mouldings to your walls. As you can see in the image above by adding a few simple mouldings and a dado rail, this plain standard wall has had an instant facelift, speaking of surgery, i like to think of adding mouldings as improving the bone structure of a room, and we all know how great folks look who have been blessed with great cheekbones will always look, no matter how wrinkly they may get! well the same principle can be applied to your walls. Below are some more examples of just how effective this can be. Here is a typically normal Scandi style set up in a kitchen, which isn't horrible by any means but see how fabulous the added detail on the walls helps to add that all important extra "layer" and takes a room from OK to WA-HAYYY!! Here in this fabulous living room, its been cranked up a notch, with a double set of mouldings, one slightly thicker than the other (you don't have to only have one) the mouldings and the walls have all been painted out in a rich dark shade, but see how the mouldings stand out even more?, add to this the mis-matched artwork and you begin to see the layers building up. So, on that note I hope i've given you all some inspiration, so that next time your thinking of redecorating one of your rooms have little think about adding that "secret" layer, I promise you wont be disappointed!